The Image Library allows you to create, cut, copy and delete folders and manage images within them. 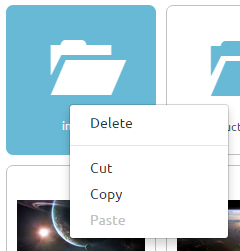 You can delete, cut, copy and paste folders by right clicking over the folder you want to work on. 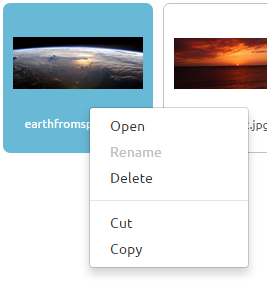 To add a new folder right click on any white space in the Image Library area; you will then be able to either add a new folder or upload an image. To open, rename, delete, cut, copy and paste and image right click on the image you want to work on. To upload an image right click on any white space in the Image Library area; you will then be able to either add a new folder, upload an image or paste either a folder or image. You can quickly add images to the Library by dragging and dropping images from the desktop into the Library.